At Advent Dental, we know that not all dental disasters happen while you’re on the way to visit our office. That’s why we welcome patients with dental emergencies to contact our Las Vegas practice right away. Dr. M. Maxwell Hejazi and his dedicated dental care team will work diligently to treat you on the same day that you contact us. We might not be able to plan for an emergency, but we can prepare. Dr. Hejazi encourages his patients to understand the basics of dental first aid in order to protect their smile until we can see them. Your quick response paired with ours, can mean the difference between tooth restoration and tooth replacement. Knocked out tooth – If you or a loved one has knocked out a permanent tooth, there’s a chance we can return the natural tooth to its socket, but we have to act fast. Be sure to call our office right away. Holding the tooth by only the biting surface avoiding touching the root, use warm water to clear blood or debris from the tooth and mouth. Once the area is clean, try to reinsert the tooth into its socket holding it in place by biting down on sterile gauze or a clean cloth. If you are unable to replace the tooth in its socket, keep it moist by holding between cheek and gums or place the tooth in a glass of whole milk and proceed to our office. 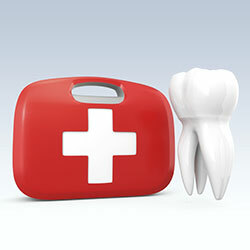 Broken tooth – Broken teeth should be repaired as soon as possible to avoid further damage. Until you can get to our office, rinse your mouth with warm salt water concentrating on the area around the broken tooth. If the reamaining part of your tooth is sharp, place dental wax (typically used for braces) or sugar free gum over the tooth to keep the sharp portion from damaging your soft tissue. If the tooth is painful, over the counter pain relievers should reduce the pain. If you must eat with a broken tooth, choose foods that are easy to chew, and try to chew away from the broken tooth. Soft tissue injury – If you sustain a deep cut or large sore on your lips, cheeks, gums, or tongue, it can cause severe pain. To stop bleeding, use a cold compress and gentle pressure. If bleeding continues, apply ice to slow the blood flow. If you are unable to stop the bleeding get to our office or your local emergency room as quickly as possible. A cool compress or ice will also help with any pain or swelling from the cut or sore. Make sure you keep the area clean. Rinse your mouth with warm salt water. Avoid applying toothpaste directly to your wound as some toothpastes contain ingredients that may adversely affect your injury. Next time dental disaster strikes, don’t panic. Call the caring staff at Advent Dental. Our convenient Southwest Las Vegas, NV office invites patients to reach out to us immediately in case of emergency. We are here to help.